Carlo Sambiagio studied chemistry at the University of Cagliari (IT), acquiring his Master’s degree in 2011. He then moved to the University of Leeds (UK), completing his Ph.D. on Cu-catalysed cross-couplings in 2015, under the supervision of Prof. Patrick McGowan. After that, he spent two years at the University of Antwerp (BE) with prof. Bert Maes, mostly exploring aerobic oxidation chemistry. 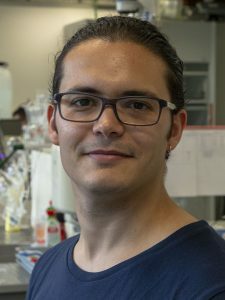 Carlo has recently moved to the Eindhoven University of Technology (NL) as an EU Marie Curie fellow to work on flow chemistry with Prof. Timothy Noël. His interests generally include metal-catalyzed transformations and the development of new methodologies for organic synthesis.